Observed at Naiberi River Camp, s.e. of Eldoret, Kenya. 15 October 2010. 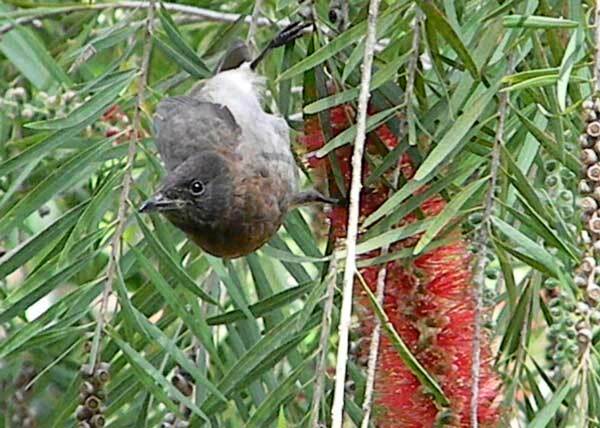 Elevation 2360 m. It is taking nectar from flowers of Weeping Bottle Brush. This is a very common bird through much of Africa, let alone Kenya, and is frequently seen in human altered habitat such as gardens and urban parks. Note the very dark head and the bright yellow patch just under the tail (feature not clearly visible in these pictures). Like the humans with whom they share habitats, they will eat a wide variety of foods, including table scraps. 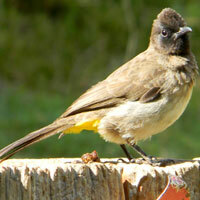 Common Bulbul feeds heavily on the fruit of Lantana, and as a result is an important vector in the distribution of this exotic invasive plant.